The Victory of the Two Crowns. The battle of Almansa was one of the most decisive clashes of the War of Spanish Succession (1700-1714). The victory of the French-Spanish army (AKA Army of the Two Crowns) under the Duke of Berwick against an Allied army formed by Dutch, Portuguese and English troops consolidated decisively the Duke of Anjou, the future Philip V, in the throne of Spain. Called by Frederick the Great "the most scientific battle of our century" the battle of Almansa was the masterpiece of James Fitz-James, Duke of Berwick, along with Marlbourough perhaps the most brilliant commander of the War of Spanish Succession . Fought out the 25 april 1707 in the plain of Almansa (Southern Castille), this battle pitted the Army of the Two Crowns formed by Spanish and French regiments against an Allied army formed by English, Portuguese, Dutch and French Protestants. Despite of the initial success of the Allied left wing, the battle was decided by an skilfull maneuver that destroyed the Allied right wing and routed the entire Allied army. Only the resistence to the last man of a Portuguese Terço (Regiment) allowed some 5000 Allied survivors to retreat towards Catalonia. Within a few days after the end of the battle, all of the Kingdom of Valencia was lost for the Allied cause and the Duke of Anjou (the future Philip V of Spain) was firmly consolidated in the Spanish throne. 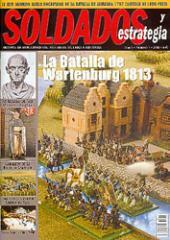 Published in issue 7 of the Spanish wargaming magazine Soldados y Estrategia, Almansa 1707 uses an adaptation of the well received Shadow of the Eagle Napoleonic system. Scales are c. 400 meters per hex and 15 minutes per turn . The system is of low-to-intermediate complexity. The sequence of play is as follows: Mutual Command Phase, Movement, offensive fire, defensive fire, melée, rally. Units represent infantry regiments formed by 1 or 2 battallions, cavalry regiments and artillery batteries, as well as formation (center, left, right wing) leaders and commanders in chief. There are also one commander-in-chief for the Franco-Spanish (the Duke of Berwick) and two co-commanders for the Allied side: the Marquis Das Minas for the Portuguese and the Earl of Galway for the Anglo-Dutch. Special and optional rules cover features such as the French-Spanish cavalry reserve, Dragoon and cavalry charges, the French fusilliers d'artillerie (infantry pickets assigned to the artillery batteries), the Allied artillery running out of ammo because most of it had been used at the siege of Villena the week before the battle, Galway joining a cavalry charge, or Formation morale.